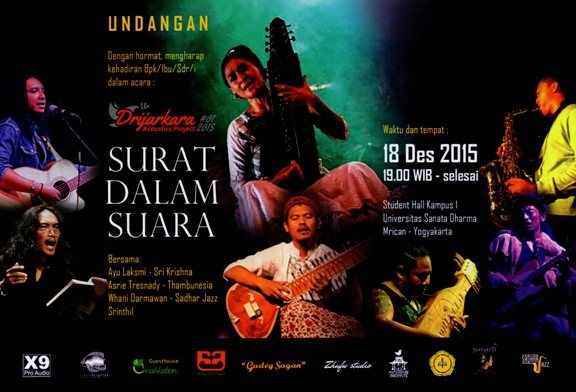 In conjunction with its 60th anniversary, Sanata Dharma University Yogyakarta held an acoustic music performnce on Friday 18 December 2015 at 7 pm till 11 pm in the lobby of USD campus one, Mrican, Sleman, Yogyakarta. The event also aimed to honour the founder of Sanata Dharma, the late Father Driyarkara SJ, who once stated that "music is energy". The performers of Driyarkara Acoustics Project #1 2015 were Ayu Laksmi, Sri Krishna, Asrie Tresnady, Thambunesia, Whani Darmawan, Sadhar Jazz and Srinthil.